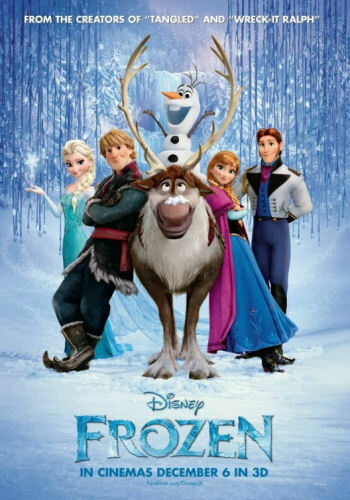 From the moment it opened, I’ve been hearing good things about the new Disney animated movie, “Frozen“. So good, in fact, that I’ve been eager to see it; alas, my schedule didn’t permit me to do so. However, this afternoon was clear, and so we snuck out for a Sunday matinee to see “Frozen“. From the opening sequences of the opening short animation, it was clear that this was not the Disney of yore. After all, since when would Disney put up a classic Mickey Mouse cartoon, in the 1930s style, before a movie. This was the Mickey of the Steamboat Willie days. But then, something strange happened — this Mickey came out of the screen into CGI-animated form, and kept interacting back and forth with the traditional form, playing and experimenting and pushing the medium to its limits. This was a clear shot across the bow: Disney is back, and they were taking no prisoners. This brought us to the main feature: Frozen. On the surface, this was a Disney princess story, drawn from Hans Christian Anderson no less. A fairy tale, so to speak. But where was the typical Disney setup? After all, both parents were present, loving, and not evil. Instead, we have two loving sisters that circumstances push apart. During the story, things keep happening that set up traditional expectations… and breaking them. There’s a cute animal sidekick — that doesn’t talk. There’s a proposal of marriage from a prince — that never turns into a marriage. Most oddly, for all the emphasis on “true love’s kiss” (who didn’t have that song from “Enchanted” running through their head), the story did not end with true love’s kiss saving the day. Instead, it was an act of bravery by a female heroine. How non-typical Disney! That’s not to say there wasn’t the typical Disney. Both female heroines were of the typical Princess built, and there were no other strong female characters. There was the typical comic relief sidekick. You can’t get everything. There’s a lot to like in this movie. First, the animation was spectacular. Realistic where appropriate, yet achieving beautiful effects that are only possible with animation. In short, the visual sequences were breathtaking. Most of the people were animated well — at least the principles. I certainly appreciated the attention to detail in both princesses, Kristof, and the Reindeer. Second, Disney finally returned to getting the music right. By this I mean that there was a period after Mulan where the music was no longer integrated with the story — there were songs, but they were in the background during action sequences. Frozen returned to the classic musical form — well-written songs that were sung by the characters and that moved the story forward. There’s a reason why Disney is exploring bringing Frozen to the stage — because it was designed with that structure (although I still want them to adapt Pixar’s Up). Third, the vocal talent was strong — particularly the leads of Idina Menzel and Kristen Bell. It is hard to talk about performances, as all the voice actor can deal with is vocal inflections, but both really got the tone right. The other vocal performances were quite strong as well. What was weak? There were quite a few sequences that were too strongly designed for 3D — and glaringly obvious in a 2D theatre. There were some points where I felt like I was on a theme park ride — I can imagine some of the snow sequences translating directly into a coaster at a Disney park. The trolls were a little too cutesy for my taste. I also felt some of the visual sequences (especially during songs) traveled too great a distance (which will create a problem for the eventual staging). In short, there’s a reason folks are saying that this one is different — that this one marks a turning point on the Disney side. I tend to agree, and it is clear they have been moving this direction since Tangled (I’ll note that I haven’t yet seen Wreck-It Ralph, and that I think Tangled was the first fully CGI-animated Disney movie of this variety (ETA: it was the first CGI animated Princess movie; the first CGI Disney feature was Chicken Little); The Princess and the Frog (which I liked) was traditional animation). I hope that the box-office and musical success of this encourages Disney to continue with this new direction — and perhaps explore some classic stories in other cultures so as to spread the empowerment. Muppets Most Wanted. Another in the new Muppet series of movies, this time pitting a bad Kermit vs. a good Kermit. A possibility because my wife loves the Muppets, but I want to see the reviews first. Malefacent. The Sleeping Beauty story, live-action, told from the point of view of the Evil Queen. Not interested. The Lego Movie. Little plastic pieces come to life on the screen. For some reason, I think this is stretching it a bit. Not interested. How To Train Your Dragon 2. I didn’t see the first; no strong desire to see the second. Pass. The Boxtrolls. This one is potentially interesting, if only for the animated style. Still, I’m more likely to see it on the small screen. So, in case you were unaware, part of the Frozen team was also responsible for Avenue Q. Compare and contrast “Would You Like to Build a Snowman” with “Give Me Some Money”, for instance. All the more reason I want to see it, and why I think it will be a great musical. If you mean the first fully CGI princess film, yes that would be Tangled. However their first fully CGI film was Chicken Little in 2005. I agree though, that this was one of the best Disney films in a very long time. The Mickey Mouse short before the film was worth the price of admission, especially considering they pieced together Mickey’s dialogue from previous recordings made by Walt Disney himself.